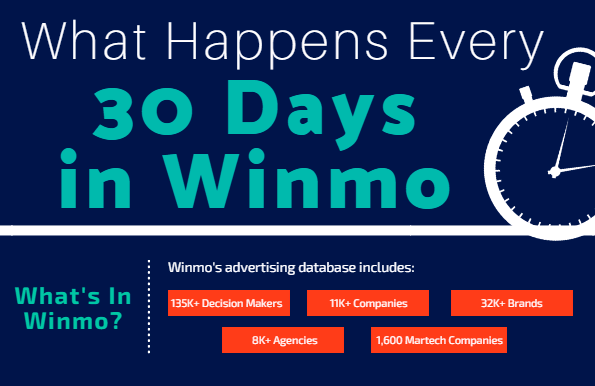 Ever wondered what it takes to build and maintain an advertising database like Winmo? A lot! Over the past 24 years we’ve built and maintained a database that today includes over 135K Decision-Makers, 11K Companies, 32K Brands, 8K Agencies and 1,600 Martech Companies. In order to maintain this massive amount of data, and most importantly keep it all up-to-date, there’s a lot of work that goes on behind the scenes. Below is a quick overview of what our research team undertakes every 30 days to maintain Winmo’s database and it’s level of accuracy. Jennifer is the Head of Marketing at List Partners LLC. and supports their portfolio of brands including Winmo, Redbooks, Access Confidential as well as Catapult New Business and AAR Partners. She's passionate about helping salespeople win more business though actionable data insights and superior new business expertise. Winmo is a predictive sales intelligence platform with a serious mission: to help more sales professionals CRUSH IT. Built just for closers, Winmo brings way more than just contacts to the table. We’re the shortcut to more deals in your pipeline, more territories to break into, more wins and most importantly – more fist bumps. From reliable decision-maker information to accurate sales predictions, Winmo raises the bar for your prospecting.